Falls and missed tricks are the consequences of losing balance when skateboarding. If you are born with good balance, you have a good start for learning how to skateboard. However, balance can be progressed with good practice and patience. Most beginners struggle to find their balance. If they tell you otherwise, they are most likely lying. The toughest part about learning how to skateboard is the first step – figuring out how to balance. If you master it, the next steps will progress much faster as you go along. You just can’t give up however. Improving the ability to keep yourself balanced on the skateboard will take time and effort. This article has been written specifically to help you with your skateboard journey as a beginner. We have elaborated on three different methods to help you better control your posture on the skateboard. 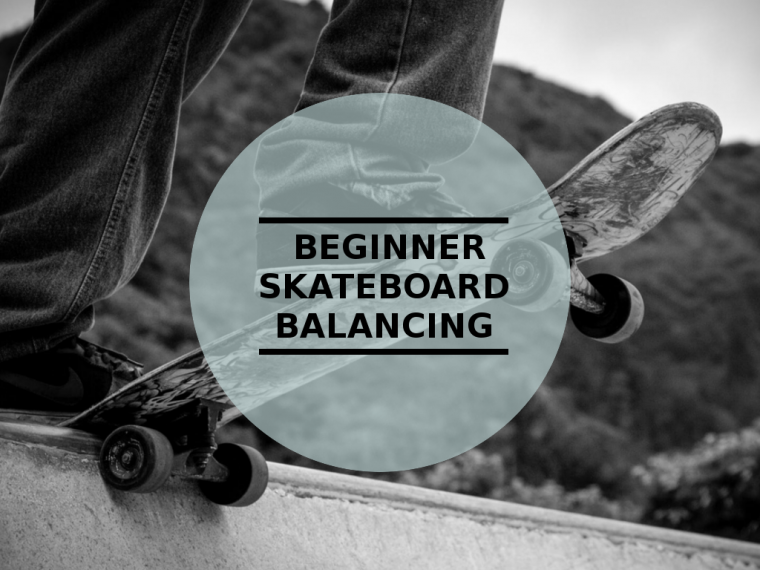 Three beginners step for learning to balance on a skateboard. Using your preferred stance to control yourself on a skateboard is important. For beginners, you can start with two most popular positions – regular and goofy. You should try both of them to figure which one suits you the most. In the regular position, you will be placing your left foot forward while you are facing to the right. Everything comes reverse in the goofy position. In this position, you will be placing your right foot forward while you are facing to the left. Most people prefer the regular to the goofy, but it is not always the case. It is ideal to spend some time doing both options to figure out which one gives you more comfort and better balance. For your information, the bolts are that tiny donut-like piece of metal used to secure the wheels to the boards. When you are standing on the board, you should position your feet just behind the bolts. Once you have the posture correct, you will find a better balance out of it. In fact, it is one of the best ways for balancing your body on the skateboard. If you position your feet in the middle, you will have less control than when they are behind the bolts. Also, it is very likely that you will break your board. For added stability, you should stand on a skateboard on grass or carpet. One important note before you master your skateboard is to balance it when it is standing still. Thus, the simplest method to make you safe when balancing the skateboard when it is not moving. When on these surface, you will find that your skateboard will move more slowly and remain steadily. Another way to stabilize your skateboard is to put a piece of wood on both sides or put your board between two cinder blocks. Besides putting something in front and behind the board to keep it from moving too fast and too much, you can hold onto a railing or a wall. This method is an easy and safe way for you to remain steady. Once you feel comfortable standing on the board while holding, try again without hold. When it comes to keeping balance, most people tend to keep moving forward and backward. And most of the time, their attempts will fail. However, you do not need to move too much. Instead, try to keep your body weight centered. As you improve with this, you can gradually shift your weights from heels to toes. When you do this, one tip is to bend your knees slightly to keep you closer to the ground and have more controls on balance. As you can get yourself still on the board, it is time to start moving. To start, place one foot on the board and the other one off the board and in front of that foot. Next, use your push on the ground to move your body forward. Again, when you do this, bend your knees slightly to keep your gravity center lower. And for this practice, it should be on a flat concrete surface. As you can start moving on your board, it is time to put that off-board foot back on. And as mentioned earlier, you should always place it behind the bolts. To have enough space for both feet, when you put your foot back on, make sure it is turned sideways. With this position, you can rock back and forth with less pressure in need, and it will be easier for you to stabilize your foot. Specifically, if you push "regular," keep your back foot onto the board. And if you push "mongo," bring your front foot onto the board. When you can control the board while it is in motion, stay on it until it stops by itself. Try to balance it along the way from when it is moving until it slows down and completely stops moving. If you are skateboarding on a flat concrete surface, it will not take long to stop. But if the surface inclines, the board will keep moving for longer. That is why beginners should choose a flat surface instead of an inclined one. With too much inclination, you will start to lose control of your board once it gets moving. But if you are ready for the hills, make sure you know how to stop the board correctly. When you want to stop the board, put the back foot down to the tail of the board. The tail will then grind against the ground, making the board stop moving. While riding the skateboard, it is advisable to try turning it around the corners. It will feel very unstable at first, but hopefully after some practice, you will know what to do. To steer your board, shift your weight with your heels. Depending on whether your heels are facing right or left, the board will turn accordingly. And if the weight is shifted to the toes, your skateboard will move in that direction. However good you are at skateboarding, if your board is of poor quality, you are compromising your own safety. There are now many brands on the market, and a good beginner skateboard is a great start when you want to begin learning how to skateboard. We all know that skateboards are everywhere. But it is worth your time and effort to consider what should be a good choice and a good value for your money. You should start asking questions from experienced people, get their advice, and then finalize your buying decision. There are also many shops that can customize your skateboard per your taste. Take a close look at all the options to see what will be suitable for your needs and abilities. Shoes made specifically for skateboarding is optional. But if you want to be serious about skateboarding, it is of course, better to wear shoes that are specially designed for this purpose. Usually, they are wider than sneakers, making your feet have a full contact area with the board. The considerable width of skate shoes also makes it easier for you to keep balance on your board. So if you want to master the balancing technique faster, it is worth your investment to have a pair of skate shoes. You can easily find them in skate shops and department stores. It is common sense to know that skateboarding is a dangerous sport. As a result, investment in safety gear is a "must do." Especially when you are a newbie in this sport, make sure you have proper gears protecting you – helmets and pads are the two most important equipments. For safety pads, you should wear them on your elbows, wrist, and knees. These are very vulnerable body parts that tend to get in contact with rough surfaces especially as a beginner skater. For the helmet, make sure it is up to the ASTM F1492 standard. This information is often found on the helmet tag. Besides the ability to protect you from the falls and collisions, wearing gears will help you feel more confident, giving you more energy and motivation to practice more. 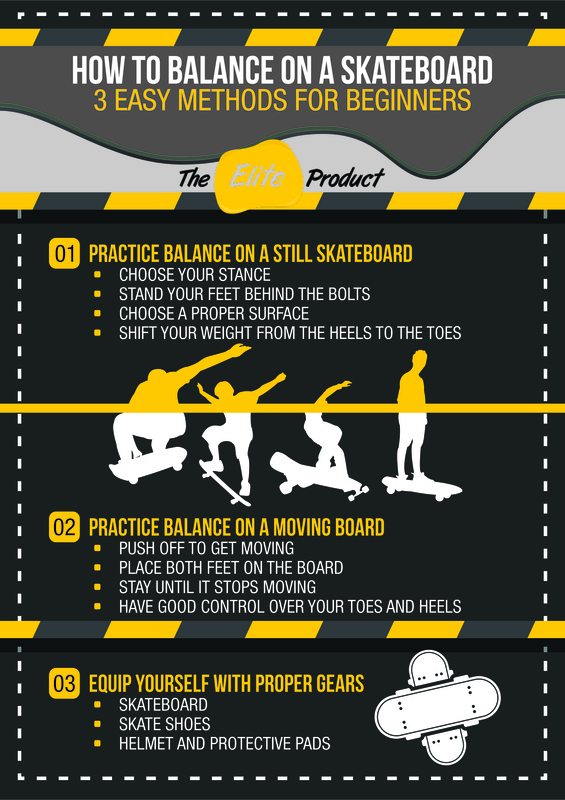 We have described three basic must-know methods for beginners that help you remain stable and balanced on your skateboard. The key to learning everything is to keep practicing, so do not give up! With practice you will eventually reach your goal. Always remember however to not compromise your safety. As a beginner skater, always prepare yourself with high-quality gears. With practice, patience, and good gears, there will be nothing to stop you from conquering your skateboard.